Guide dogs are highly trained at acting as the eyes for their blind owners, but sometimes they can be quite skilled in matters of the heart as well. In 2012, Claire Johnson and Mark Gaffey were strangers who had both signed up to be paired with seeing-eye companions at a guide dog training program in the UK. During the rigorous two-week course, their new Labrador retrievers, Venice and Rodd, became inseparable -- and soon enough the two humans did as well. "As the weeks were going on, everyone was saying how much our two dogs seemed to be getting more friendly with one another than any of the other dogs," says Mark. "In fact, the trainers said that it was the romance of the course, the two dog," adds Claire. "They'd always pull towards one another, ignore all the other dogs." Eventually, as the pair spent more time with one another at the behest of their dogs, the two came to realize that they lived just a mile and a half apart from each other back home. So, once the course ended, the pair agreed to use that newfound sense of mobility provided by their dogs to meet for playdates for the affectionate animals. In time, romance began to blossom between Claire and Mark too, and those playdates became real dates for the happy foursome. Last year, with his dog Rodd in tow, Mark proposed. Claire, and presumably Venice, were thrilled with the idea. 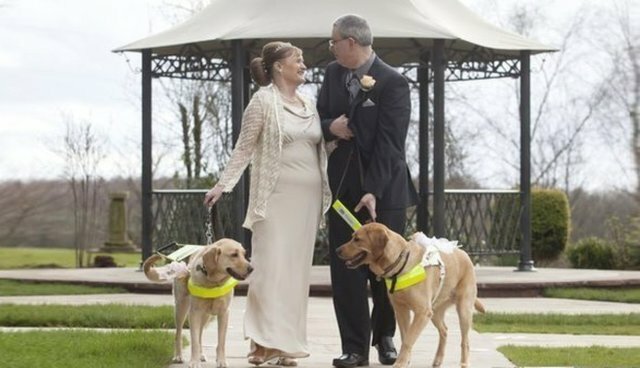 On Saturday, the blind couple tied the knot -- their matchmaking dogs serving as ring bearers to make official the relationship they helped to build. "I have no doubt that our guide dogs brought us together and helped me find my true love," says Claire. "Much like our two guide dogs, we really are best friends and soul mates."